Last night, Glass Explorer Cecilia Abadie shared a post asking fellow Google+ users for some advice. Abadie had been given a traffic ticket "for wearing Google Glass while driving" and wondered if the cop was wrong, or if driving with Glass is already illegal in California. Accompanying the post, Abadie shared a photo of the ticket itself. 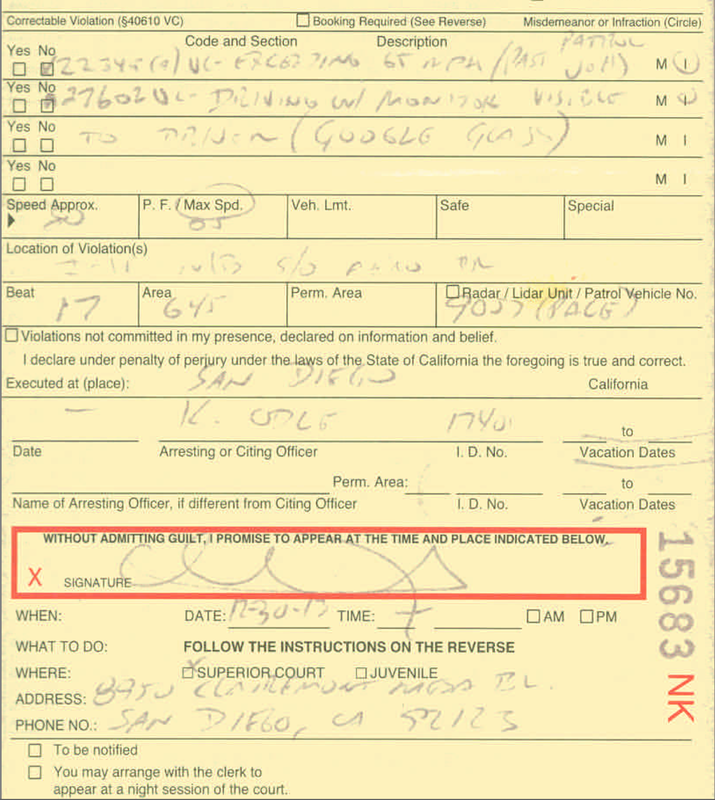 It’s easy to be angry that the cop would choose to list wearing Google Glass while driving as an infraction, but it’s also important to note that the ticket in question lists a speeding infraction as well. Specifically, it indicates that Abadie was going approximately 80mph, in what she says was a 65mph zone. The infraction which the officer specifically related to Glass was for "Driving with monitor visible to driver," citing section 27602 which you can read here. 27602. (a) A person shall not drive a motor vehicle if a television receiver, a video monitor, or a television or video screen, or any other similar means of visually displaying a television broadcast or video signal that produces entertainment or business applications, is operating and is located in the motor vehicle at a point forward of the back of the driver's seat, or is operating and the monitor, screen, or display is visible to the driver while driving the motor vehicle. (1) A vehicle information display. (2) A global positioning display. (4) A visual display used to enhance or supplement the driver's view forward, behind, or to the sides of a motor vehicle for the purpose of maneuvering the vehicle. Along with several other exceptions for devices that keep the driver from using them while driving or are displaying information but which have an opaque cover. So, who's right? In all likelihood, Glass' display was not visible to Abadie, since the device's screen spends most of its time off to conserve precious battery power. That said, 27602 is nothing if not a little fuzzy. It describes a display that is "operating ... or operating and the monitor ... is visible to the driver while driving the motor vehicle," which could mean a device that's operating but not currently displaying anything, or one which is displaying and operating. The only certain thing about that portion of the law is that it shouldn’t be located forward of the back of the driver’s seat. Even with that ephemeral moment of clarity, the question of whether a new technology like Glass is exempt from this law remains. Glass doesn't automatically activate its display to show notifications, even if you're navigating (though it does flick on for each new direction), but California does have laws dictating how and where GPS or navigation devices can be used in a car, and the user's eyeball isn't an explicitly provided-for location. At any rate, it's clear the law wasn't written with Glass accounted for. The fact that the ticket's first infraction is speeding an apparent 15mph over the limit is still important to consider - while the law cited in relation to Glass is certainly not crystal clear, Abadie will also be up against a speeding infraction, which will make her case that much harder. If the ticket were solely written for Abadie wearing Glass, I’d be more inclined to think of it as an important case in the life of Google’s nascent wearable. As it stands, if Abadie decides to fight the ticket, it’s hard to see how it would have any significant impact on wearable technology. 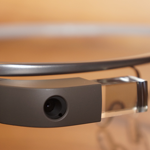 To assume it would is also to make the assumption that the addition of “(Google Glass)” to the ticket is significant to the judge and that a traffic court case will influence California law, or that this case will escalate to a more influential court.